This newly-built holiday home, suitable for one or two people ,is situated right next to the beach Skrea Strand in Falkenberg. Falkenberg is a very popular summer holiday town, offering plenty of activities and entertainment. 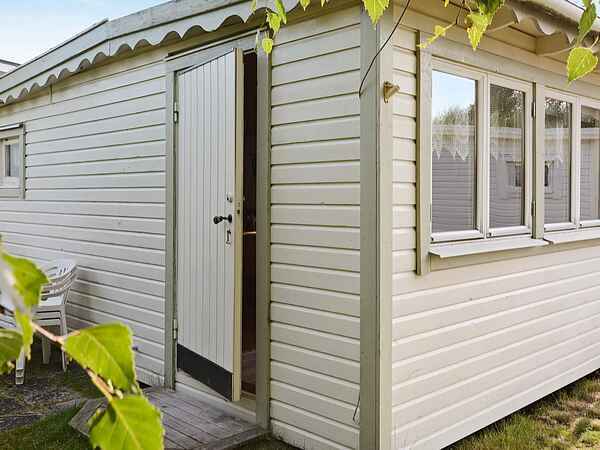 The small, cosy cottage/ beach hut features a kitchen area and a living room with a sofa bed. It is situated right by the lovely sandy beach in Skrea. Apart from bathing, this area offers mini golfing, a tennis court, an indoor swimming pool, restaurants, a fish 'n' chip shop, and a luxurious hotel with a spa and a delicious break buffet open to the public. This is the perfect place for enjoying nature and the recreation it brings! Falkenberg offers plenty of beautiful walking paths and excellent fishing opportunities. There are also riding possibilities. There are plenty of other lovely bathing spots within a few kilometres. Stroll through the Old Town and admire the picturesque view, stop for a coffee in one of Falkenberg's excellent cafés, such as Ståhlboms. Take a walk along the River Ätran and admire the stunning view. Falkenberg offers shops, restaurants, bars, music events and and an outdoor theatre specialising in Swedish slapstick comedy known as “buskis”. The famous shopping town Ullared, known for it's great discounts, is only 35 kilometres (a 30-minute drive) away. Please note: The cottage has no bathroom. All of the bathing huts/ cottages in the area use a communal bathroom and shower facility. No smoking! Welcome to this beautiful holiday home!